Def Leppard singer Joe Elliott was interviewed by Hit Fix for their Culture Pop podcast recently and talked about discovering KISS in the mid 70s. Joe talked about how he first heard the band and seeing them live in the UK. He also spoke about the upcoming Summer Tour 2014 which was announced on 17th March in Los Angeles. "Let's back track the first time I came into KISS's orbit was the summer of '76. I went down town in Sheffield like I always did on a Saturday morning with my saved up dinner money cause I didn't eat at school, pocket money or whatever. And I walked to Bradley's Records which was our main hang out to buy records in. And there was this huge poster of the Destroyer cover in the window six foot high and these guys stood like cartoon style on top of this burning hill. And I remember looking at it and thinking I'd heard of KISS but I'd never ever heard KISS. I knew they'd wear make up but so did the New York Dolls so I didn't know how it went and this is pre Internet of course so you couldn't just go online and look for it. If they weren't in the newspapers you never saw them. And I saw this thing and I thought - I remember - I distinctly remember thinking if they sound like they look this is gonna be amazing cause it's 3D. It's larger than life, it's cartoon superhero. It's what rock 'n' roll to me should have been all about. You know, escapism and I went in and I abandoned whatever record I thought I was gonna buy that week and I said I want that. And I took Destroyer home and it did not disappoint at all. I mean to this day I still think it's the best record they've ever made. Ever, ever made and they've made some good ones but that's a tremendously thorough record from the first note to the last one. It's just a great record." "So that was the first time I ever came across KISS and from that moment onwards. It was a beautiful thing in the seventies. The same thing happened to me with Rush and U.F.O. and Thin Lizzy. I discovered all these bands on their fourth album. So I could go back and get their third and their second and their first. Months apart as opposed to years apart. So I was back tracking and going OK this one's not quite as good as this one but it was getting there. You realise it was a lead up and the way that people's careers were they - nobody was expecting your Van Halens or your Boston's first album to blast out the window and it's the biggest record you'll ever do and everything else will be kind of below it for the rest of your career. They were going like us and Bon Jovi the same thing, Elton John. Even The Beatles it was all on a - working it's way up to your Sgt. Peppers and Destroyer is theirs." "So of course by then I'm like you know I was a total fan and the first time I ever saw them coincidentally was when Phil was opening for them in a band called Girl. They toured Britain in 1980 and they played the Bingley Hall in Stafford (5th September 1980). And I kind of got to know Phil by then a little bit so two birds with one stone there I went to see KISS on stage for the first time. It was a horrible hall. A horrible echoey place so it was no judge of sound. But they were you know such a spectacle to see. The next time I saw them was many, many years later. I mean I'd watched their career all through the 80s and the 90s when they took the make up off. They put it back on again and the next time I saw them was '96. I'll tell you why I remember this because we were playing Wembley Arena the night after they did (25th November 1996) on the Slang tour. So we had a day off in London so we went down to see KISS and then the next night we went up and did our own thing. So I've only actually seen them live twice in all the time that I've been a fan. But that's not because I didn't wanna go it's just cause I'd never had the chance. Yeah it's a little difficult if someone's says you wanna go and see KISS - No I can't I'm playing Seattle myself." 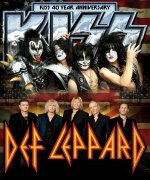 Travel with KISS on tour? "Well there is possibilities that we've been discussing that - I for sure am gonna leap on - well I don't think it's the KISS plane - just a plane. But I know Gene and Paul are planning to fly and I already had words with Doc and I said Have you got a spare seat?. He went yeah. I said right save it for me. I'm not gonna travel on it every day. It would be disrespectful for them. And in fairness when we've only got maybe a two hour drive I'm happy enough to just sit on a bus and just check into my room and go to bed you know. So we'll just play it by ear. It is very relaxed in that respect. I hope and I think that's how it came across in the press conference. That the two bands sat down on the stools at the House Of Blues on stage and you could tell instantly that although some of the guys had never met. There was the respect of knowing who they were. But I knew Paul and I knew Gene and I've met Eric and Tommy over the years. In fact when the Down 'N' Outz played the Sheffield City Hall back in 2010. Gene and Eric were actually stood at the side of the stage while we were playing Love Lies Bleeding the Elton John song."